Thirty years ago I read the Bible for the first time. I was forty-two. What I saw, was John the Baptist, Jesus, and the Disciples had opened the Judaic Religion – to everyone! Saul-Paul closed The First Church, and shut out the Jews. Therefore, I declare the Catholic and Protestant Churches – dead! Only the Moravian Church – survives! This Church is open to everyone! Geography is the science which studies space and its construction, not only its physical construction but also its social/political one. In other terms geography can be the discipline in quest for meaning of space. And cartography is the science of interpretation of power relations and communicating it via maps. In the light of these tow definitions we exposed, on this site, the rapports between the political centre, space and representation in some famous maps. First we worked on the maps of Heinrich Bunting: Jerusalem and Europe. Then we saw the Dutch Lion of Visscher. 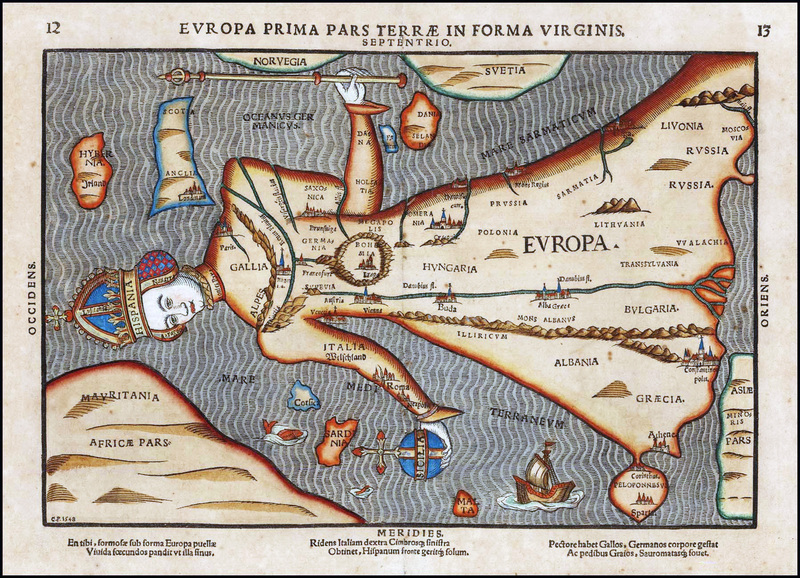 Today our map is the BOHEMIAE ROSA, by Chr. 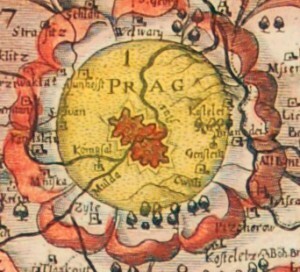 Vetter, Vienna, 1668, a map representing Bohemia as a rose centred on Prague. 1526, the catastrophic battle of Mohacs, and Louis II, king of Hungary and Bohemia, falls in the battle. The Turks occupy most of the Pannonian plains of Hungary. The rest of the country, still free from the Ottoman yoke, elected Ferdinand of Habsburg, brother of Emperor Charles V, as king of Hungary (Or king of the Regnum Marianum, a formal name of the country). Then and the Lands of the Bohemian Crown followed and elected him king of Bohemia and ex officio prince-elector of the Holy Roman Empire. Thus in 1526 a four-century period of Habsburg rule in Hungary and Bohemia began. Bohemia was already the “crossroads” in the heart of Europe and a cornerstone in the Habsburgs’ policy in the Holy Roman Empire, at the same time an important rear operating base against the advance of the Turks in the heart of Europe. 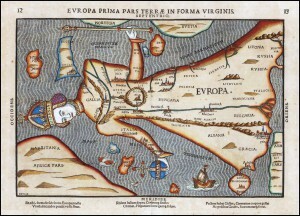 The Europa Prima of Bunting shows this Habsburger view of Europe and of the European international system of that time: while the “centre-head” is Spain the heart is Bohemia (See FIGURE 2). Keeping Bohemia was expensive for the Habsburgs: we can remember that the Thirty Years’ War began in and because of Bohemia. It was, also, an economic heart of the Habsburg Possessions in Europe: being rich in soil and silver mines, and even a birthplace of the Thaler, the silver coin ancestor of the Dollar. 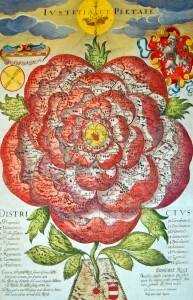 The map shows Bohemia as a rose centred on Prague which forms its style. The Bohemian counties are the petals (mapped in an accurate way) and the adjacent countries are the leaves. The “soil” from which the rose arises is Austria and Vienna is at the origin of the rose’s foot. The motto above reads IVSTITIA ET PIETATE (Justice and Piety), personal motto of Leopold I, then Holy Roman Emperor and head of the House of Habsburg. The Habsburg policy over Bohemia is clear: it is a rose, a most beautiful part, of the possessions, but this rose grows over the blood, shed by the Habsburgs and Austria, to protect it and to make peace. We can remember that the map was drawn in 1668, a time very “shaky” for the Habsburgs: Austria had signed the Peace of Westphalia in 1648 after the very bloody Thirty Years’ war, which had begun in and because of Bohemia in 1618. Then by that time Austria had just survived a Turkish invasion in 1663-1664 while another one was being prepared (of what would come to be known as the Great Turkish War or the Holy War of 1683). The price was very high and the Habsburg army suffered from great human losses to stop Turkish advance into Europe. This map is an antithesis to the famous saying attributed to Emperor Maximilian I Habsburg: Bella gerant alii, tu felix Austria nube – ‘Let others wage war: thou, happy Austria, marry’. Prague is depicted as centre of Bohemia: it has been its capital city and religious and economic centre since the Tenth Century (see FIGURE 3). The interesting part of this map, the one related to the centre and centrality, is between Prague and Vienna: the first is the style of the rose, so its “apparent” centre. Yet the “real” one, the origine in the soil, is in Vienna (see FIGURE 4): the soil from which Bohemia grows is Austria, “watered” with blood and necessary to life and survival of the rose. By that time the Habsburgs, archdukes of Austria, were kings of Bohemia. Thus their rank was higher in the latter, plus Bohemia was an Electorate of the Holy Roman Empire. But Vienna was the kaiserliche residenzstadt (Imperial residence) of the Habsburgs, thus the “head” of their possessions in Europe and the de facto Imperial city of the Holy Roman Empire. For these reasons Vienna was the seat of power and the origin of the rose. The Emperor, Leopold (see FIGURE 5), began the centralising processus on Vienna: that time the Habsburg Possessions had no cenral administration and every part was governed as a separate entity. 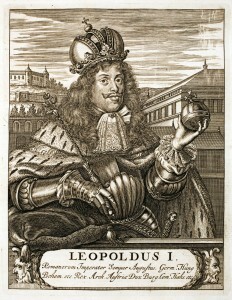 Leopold I began to reinforce the position of Vienna as the Imperial residence and the city which hosts central powers to all the Possessions. Thus Bohemia is a rose centred on Prague, but which grows from Vienna, more discreet on the map but a much more powerful political centre, or “real centre” in this regard. This “real centre” (or what we call a “head-centre” in this site) is thoroughly mapped since the XVIth Century (see FIGURE 6 for example) and was the seat of power of the Habsburgs between the XIVth and the XXth Centuries: but its centrality was discreet at the beginning. This discretion can be visible in our map: the apparent visible centre of Bohemia is clearly Prague. Vianna is more essential as it is the origin of the rose, yet it needs a more wandering eye to find it. In this site we have already seen and analysed he Europa Prima and demonstrated the difference between a centre-head (a seat of political power for example) and a centre-heart (a sea of economic power and production). 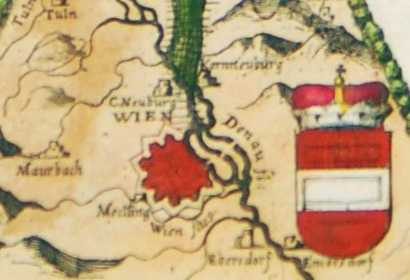 In this map, Rose of Bohemia, Prague is depicted as an apparent centre of the map. But the most important point is Vienna: the city from which the rose grows. Modern examples can be quite numerous: many seats of power, centres-heads, prefer to be discreet and be not in the focus of a national image. We can find some parallels, mutatis mutandis, with Washington DC and New York, with Amsterdam and The Hague, with Sydney and Canberra etc. Of course these cases are different (plus some are formal and some are not), yet in all of them the political centre tends to be rather discreet, even on the maps, while a more “rosy” centre is the focus of attention even if its real power is much less important. We tend, more and more, to represent centrality as an axis: in an axis it is clear that power cannot be equally distributed. Thus some points of the axis control all the movement and distribute power over the whole. The centre, the Greek kentron, is originally the most eminent point of an axis and the attribute of power. 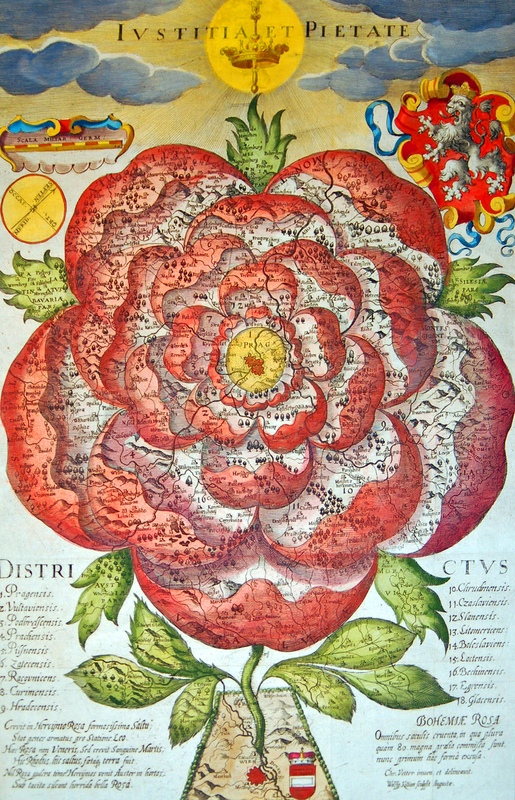 In this regard we can say that the Rose of Bohemia is but a representation of power relation on this axis, the one of the Habsburg Possessions and where the focus of the map takes its power from a more discreet, yet the most powerful, point of the axis. [*] The Hercynian Forest (In Latin Hercynia Silva) is the old dense wood covering the central European mountain system. In Latin: Crevit in Hercÿnio Rosa formisissima Saltu; Stat penes armatus pro Statione Leo. Haec Rosa non veneris, Sed crevit Sanguine Martis; Hic Rhodus, hic saltus, faetaque, terra fuit. Nil Rosa pulcra time! Hercÿmos venit Auster in hortos; Sub tacita sileant horrida bella Rosâ. BOHEMIAE ROSA Omnibus saculis cruenta, in qua plura quam 80 magna pralia commissa sunt, nunc primum hac forma excusa. For further information on the Rose of Bohemia, you can read the Strange Map entry on this map. You can also see some acounts of the map and some other on the site of the National Technical Museum of the Czech Republic. Some informaion are also available on the European Library site. A zoomable version of the map is available here. 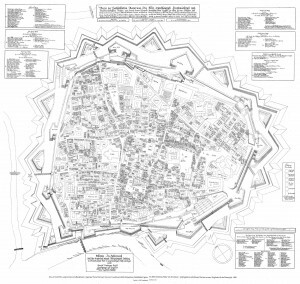 You can see the Habsburg site for the very good mapping of the Habsburg Monarchy during the centuries. Equally, the same site offers a good account of Leopold I of Habsburg. Some plans of Vienna are available on this site. The notion of the residenzstadt is explained here on the site if the University of Munster. 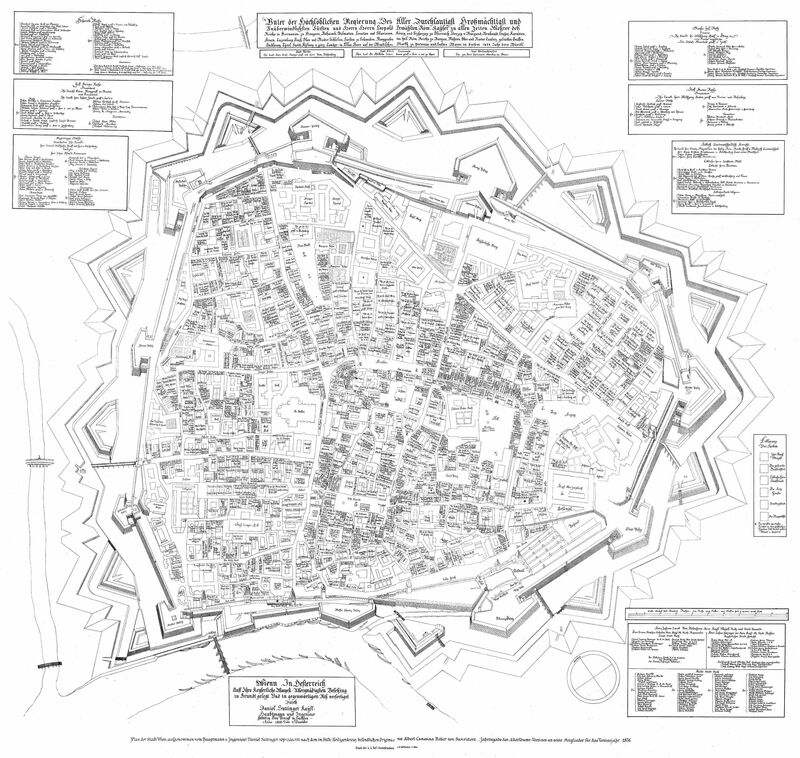 The Suttinger’s map of Vienna is explained here. A.E.I.O.U., the motto of the Habsburgs and of Austria.